The size is clearly written on the handle of each hook, and each handle is also color coded. This makes it easy to choose the right hook at a glance without needing to think about anything. They are very lightweight and easy to handle. The brightly colored crochet hook grip isn't just practical, but it's fun too. The crochet hooks ergonomic design makes it fit the hand perfectly. They are easy to grip,and very comfortable to use even for long periods of time. These are premium crochet hooks and much better than cheaper types of hook. They make a perfect gift for anyone who is interested in arts and crafts. Whether they are new to crochet, or an experienced crocheter, this crochet hook set will include everything that they need to get started and have some fun. What Makes this Crochet Hook Different? They are a premium quality set made from the highest quality aluminum and brightly colored molded ergonomic handles. The whole set comes in a transparent case and all of the crochet hooks are color coded and easy to identify. A sharp crochet hook will make crocheting much easier and more enjoyable. 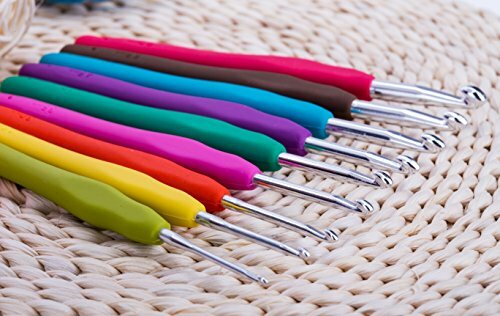 These ergonomic crochet hooks can be used for hours without any discomfort thanks to the hand friendly design. Non-sticking Ergonomic Grip makes the crochet hook very comfortable to use even for long periods of time. Make the ideal gift for any craft lover. Not just practical, but it's fun too. ONE Year Warranty for All Crochet hooks Sold By FESTIVAL HANDS ONLY. View More In Crochet Hooks. If you have any questions about this product by Festival Hands, contact us by completing and submitting the form below. If you are looking for a specif part number, please include it with your message. © 2019 - designers-artists.com. All Rights Reserved.